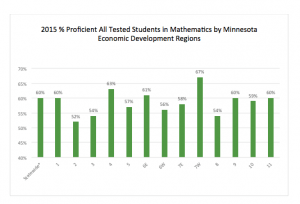 MREA released today a regional analysis of the 2015 MCA test data in math, reading and science from the Minnesota Department of Education (MDE). 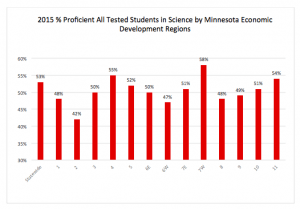 Among the most striking results is rural Minnesota severely lags in science achievement. The analysis also revealed that one Greater Minnesota region is leading the state in overall achievement. 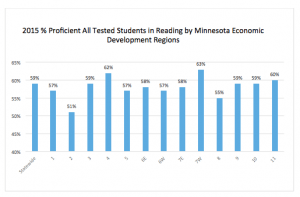 Students in the school districts located in Minnesota Region 7W — the counties of Benton, Sherburne, Stearns, and Wright — outpaced the achievement of the state and all other regions in the 2015 MCAs for reading, math and science. The region is 88 percent white and 3 of the 4 counties have less than 12 percent of their children in poverty. 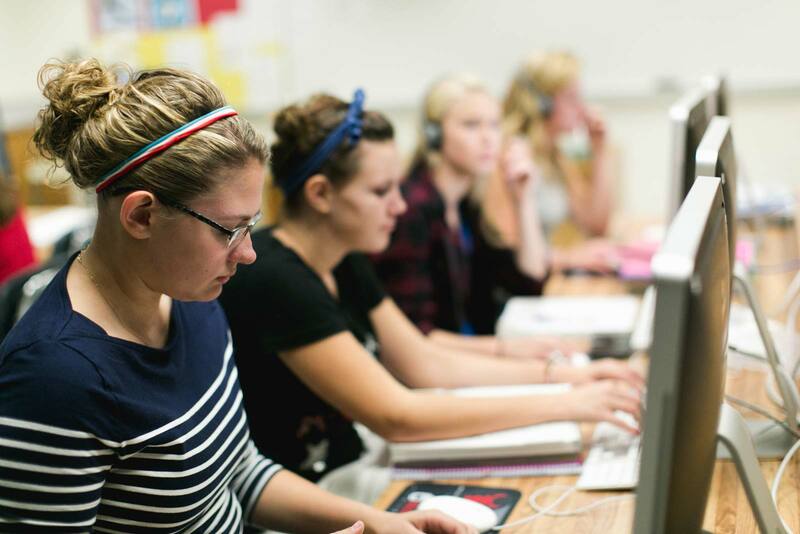 The districts in this region are adding value to lead the state in student achievement in all three subjects, but face fewer of the conditions underlying achievement gaps in Minnesota. MREA provides below an overview of results in key areas including: regional differences in achievement in science, math, and reading as well as demographic differences. The MCA results provide a benchmark that school districts can use to understand achievement in their region and identify trends. Benchmarking and tracking achievement gains in one’s district as compared to benchmarked districts is a proven strategy to generate achievement gains in a school district. Among the most striking results of the regional analysis is that in 10 of 12 rural regions, student achievement in science trails the state average. In reading 7 of 12 rural regions trail the state average. This is not the Lake Wobegon effect, and rural educators need to analyze this further and consider strategies to address this. In science, of the students tested in region 7W’s school districts, 58 percent met or exceeded proficiency standards in grades 5, 8, and high school. This is 5 percent above the state average of 53 percent. Ten Greater Minnesota regions trail the state average. In math, of the students tested in Region 7W’s school districts, 67 percent met or exceeded proficiency standards in grades 3, 4, 5, 6, 7, 8, and 11. This is 5 percent above the state average of 60 percent. * Regions 4 and 6E are also above the state average. Five Greater Minnesota regions trail the state average. In reading, of the students tested in Region 7W’s school districts, 63 percent met or exceeded proficiency standards in grades 3-8 and grade 10. This is 4 percent above the state average of 59 percent. Region 4 is also above the state average. However, seven Greater Minnesota regions trail the state average. In MDE’s MCA fact sheet of the 2015 results, there are 30 percent differentials between white students and black, Hispanic, and American Indian students, and between all students and students eligible for Free and Reduced Lunch. 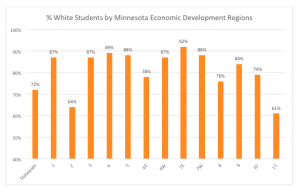 From the MDE 2013-14 enrollment by ethnicity report, MREA has released the following chart of the percentage of white students by Economic Development Region. The state average is 72 percent white students. All Greater Minnesota regions exceed that percentage with the exception of Region 2, Headwaters. 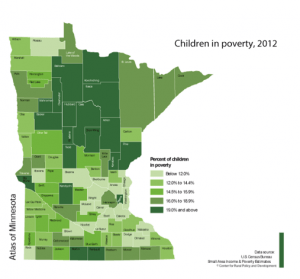 While not perfectly aligned with Economic Development Regions, this map of Children in Poverty from the Center for Rural Policy Development shows patterns of poverty and the absence of such across the state. including over student achievement in reading, in math and by ethnic group and how it compares to recent years. The data for this post are found on the MDE online data center and the Center for Rural Policy Development’s Atlas. *The MDE Fact Sheet states the math MCA proficiency rate is 62 percent. According to MDE’s charts, only 60 percent meet or exceed standards. The ‘partially meets’ category has an index which factors into the proficiency standards but is beyond MREA to calculate accurately. To accurately benchmark a district in math, use only the meets and exceeds proficiency count in your district. There is no difference in proficiency rates for reading or science.